There have been a couple of News items on this of late. Pasting one of them. Now, if every one is free to choose his or her religion, why complain only when some one converts to Hinduism. Calling for Peluji, SanjayT and Marvi pais. Assaduddin Owaisi of the AIMIM said Muslims were “not scared” of conversions and would continue to follow their religion. Under Opposition fire for allowing RSS and its affiliates to push ahead with their conversion and ‘ghar wapsi’ campaigns, the Government told Lok Sabha Thursday it was in favour of anti-conversion laws in all states and at the Centre too. Opening a three-hour discussion on the issue of religious conversion — it was agreed upon after chaotic scenes in the House over the Agra incident involving the conversion of 57 Muslim families by Bajrang Dal activists — the Opposition mounted a spirited attack which lost steam when one of its own, the Samajwadi Party, broke ranks. Quoting Shakti pai from other thread.. I liked the response of Amit Shah at aaj tak press conclave on conversions..
"Discussion by media will change nothing.. Lets bring a law that bans conversions by enticement, fraud, etc etc .. "
Will all sides be able to agree on this? Where will Muslims and especially the Christians lean? Quite obvious ain't it? THere was an hour long program on this by 'Sudarshan Channel' Did anyone watch that?? I'm not for ghar wapsi .. No point of these shenanigans. Better to bring in a law banning it by deceitful way. And reporting in flow of funds from abroad for conversions. May be these ghar wapsi incidents are planned to start the conversion debate. Btw, south India is half converted already anyway. Is being an Atheist amount to conversion ? The way these events are organized - and with pre- and post-event publicity and discussions - it has all the hallmark of a marketing gimmick/publicity stunt. The whole idea of conversion to Hindu religion is flawed. 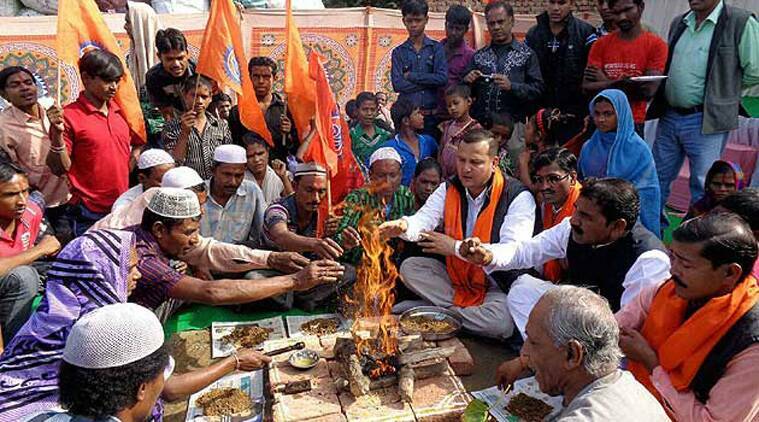 Hindu religion does not need such thing. Anyone can practice being Hindu. Unlike Christians, Muslilms or Jews , there is not such procedure to convert someone to Hindu. As per Hindu religion " Sarva Dharma Sama Bhava" is a concept of Modern Hindu religion so basically all these conversions are fake . There are lots of Mulsims that go to temples and pray. Even in my fiath . Someone is doing some chutiayapa and opposition is using these to avoid Jail time from scams. No one appointed you as caretaker of religion. Congress leader Nilesh Rane on Tuesday stirred up a controversy when he advocated religious conversions to prevent incident like the Sydney siege from happening in India. “With incidents like the 1 happened in Sydney happening almost everywhere, India should target on converting as many people to Hinduism,” Rane, son of party strongman Narayan Rane, tweeted. A heavily-armed man of Iranian-origin yesterday held 17 people hostage at a cafe in Australian city of Sydney. The 17-hour long incident resulted in three deaths. Two Indians were also among the captives but they escaped safely. The former MP’s remark comes at a time when the incident of alleged forced religious conversions in Uttar Pradesh has triggered country-wide revulsion. Amid demands that Prime Minister Narendra Modi make a statement over the issue, the opposition parties staged protests in Parliament, disrupting functioning of both the Houses. Rane, however, defended his remark, saying that the conversion issue should not be politicised, and if people want to change their religion, they should be given freedom to do so. “I, being a Hindu, wish that there should be no politics played over the conversion issue. It is not as if people are being converted at gun point. Seeing the terrorist activities happening around the world, it is necessary that a Hindu stays alert, so that such activities (Sydney incident) do not happen in the country,” Rane said. How many days till he's kicked out of Congress and joins Sena/BJP? But what's this about conversion to the "Hindu" religion ?? According to the RSS philosophy, aren't all the Indians already "Hindu" ?? They have asserted it time and again. I guess it is the time for them to clarify what exactly is a Hindu ? A practitioner of the Sanatan religion or an Indian citizen or some esoteric definition..
No, all Indians came from Hindus.. so they may be Muslim or Christian or Sikh or Jain, they were at one time Hindus, in a previous generation or this one itself. Their origin is Hindu. So ghar wapsi is apparently about bringing them back to the fold. I don't care about the minuscule people doing the drama or real conversion, whatever it may be. Now these people who are returning home, per say, what caste do they go into? I mean for them that may be a bigger question.. For any religion religion, caste/sect is a bigger concern in all religions. Similar treatment will be meted out if they enter lower stratas of the particular religion. Example - Protestants don't get much rewards in India for being Christians.. Like 45% marks in 10th to get admission to science in Christian college in Bangalore for Catholics and 70% for Protestants. General category 85%. Last edited by sarv_shaktimaan; December 16th, 2014 at 12:42 PM. wow. and i thought I dont have much productive work to do in life. I guess it is the time........to clarify what exactly is a Hindu ? Last edited by badriprasad; December 16th, 2014 at 08:34 PM. Yeah, that's another question. Which caste will they belong to after conversion. If they were SC/ST/MC/BC/OBC before the conversion, will they give up the benefits accrued to their previous caste ?? In some convent schools in Surat, christians are guaranteed admission and fees concession, whereas the others don't get admission to pre-KG even on applying in January for the May classes and paying a hefty "donation".